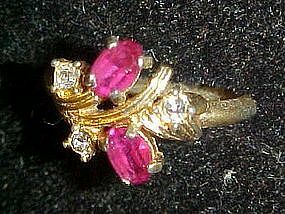 Vintage Avon ring called Royal Radiance. Two oval Fuschia stones highlighed by shimmering rhinestones. Gold tone setting. Issued in 1975. Excellent condition. Size 9 1/2.